If you’re looking for maximum interior space for passengers and equipment, extra comfort or towing capabilities, then a full size van may be a wise choice. Full size vans are now available in a variety of lengths and heights which allows you to choose the best configuration to suit your needs. Many models now offer extended roofs and doors making them ideal for adding wheelchair lifts in either the side or rear location. Special non-skid flooring and wheelchair restraint systems can also be added to safely transport single or multiple wheelchair occupants. You can choose from gas or diesel engines depending on your requirements, and many convenience features are now available as standard or optional equipment. Choices may include the Ford Transit, Mercedes Benz Sprinter, Dodge Promaster, and the Chevrolet Express or GMC Savana. 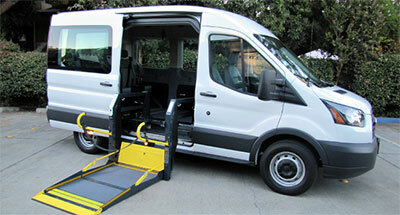 Our certified mobility consultants are happy to discuss the advantages that a full size van conversion has to offer. Contact Goldline today for further details and information.